* CHML songs and stars of ‘Main Street Jamboree'.” Book no. 1. Toronto: BMI Canada, 1952. 39 p.
* Cadman, Charles Wakefield. Meet Arizona: a dude ranch comedy : operetta in two acts / Charles Wakefield Cadman. Libretto by George Murray Brown. Boston: C.C. Birchard and Co., 1957. 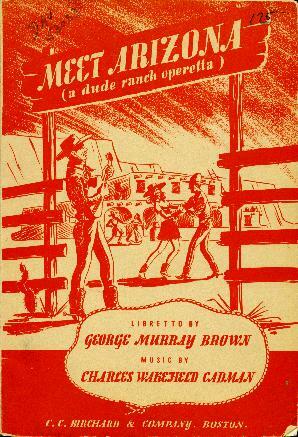 142 p.
Subtitle on cover: a dude ranch operetta. Cal Shrum and his Rhythm Rangers. Hollywood, CA: Sunshine Music, 1946. * Calaway, W.R. My Rocky Mountain sweetheart / W.R. Calaway. Chicago: Calumet Music Co., 1932. 2 p.
Cover: Featured by Frank Stava, "Yodeler" Si Perkins Group, WCFL. The Calgary Kid's stampede of songs. New York: Famous Music Corp., 1945. * The Calgary Kid's stampede of songs. [No. 1.] Toronto: Canadian Music Sales Corp., [c1942]. 63 p. 25 songs. Allen Erwin is the Calgary Kid. The Calgary Kid's stampede of songs. No. 2. Toronto: Canadian Music Sales Corp., 1945. Songs: "Alberta prairies", "Dude ranch cowboy", "Hilly Billy Bill from St. Joe", "I'll never see my darling anymore", "Going back to Peaceful Valley", "Hills of old Wyomin'", "Silver on the sage", "Kentucky moon". 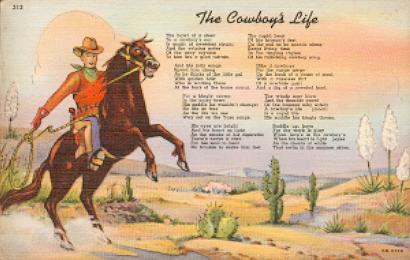 The call of the West, Hamilton Kennedy's cowboy, hill-billy and home song books. London: Paxton and Co., 1941. * Canadian tops in pops. Toronto: Music Associates, 1947-195-? v.6, no. 7, Apr. 1956. 2 p. See: "Western sellers." Cap, Andy and Milt's roundup of song hits. New York: Dixie Music Publishing, 1945. * Carey, Joseph B. Sierra Sue / Joseph B. Carey. New York: Shapiro, Bernstein and Co., 1940, 1924, c1916. 5 p. Cover: Blue Barron and his Orchestra. * Carl Smith folio no.1. New York: Hill and Range Songs Inc., 1954. 36 p. Ill. 14 songs. * Carl Smith souvenir songs, WSM Grand Ole Opry. [Nashville,TN]: Grand Ole Opry, . p. Ill. 6 songs. * Carmichael, Hoagy; Brooks, Jack. Ole buttermilk sky / Hoagy Carmichael and Jack Brooks. New York: Burke and Van Heusen; Toronto: Canadian Music Sales Corp., 1946. 5 p. "As sung by Hoagy Carmichael in the Walter Wagner production 'Canyon Passage'." * Carr, Michael; Kennedy, Hamilton. Ole Faithful / Michael Carr and Hamilton Kennedy. The sensational British song success. New York: Shapiro, Bernstein and Co., 1934. 5 p. Copyright Irwin Dash Music Company, London, England. Cover: Fred Waring. * Carroll, Harry; Macdonald, Ballard. The trail of the lonesome pines. Words by Ballard Macdonald; music by Harry Carroll. New York: Shapiro, Bernstein and Co., 1913. 5 p. Cover: Gilson and Tolon. * Carson J. Robison's world's greatest collection of mountain ballads and old time songs. Chicago: M. M. Cole Publishing, 1930. 50 p. 31 songs. See: "Dying sowboy," "Bury me out on the prairie." 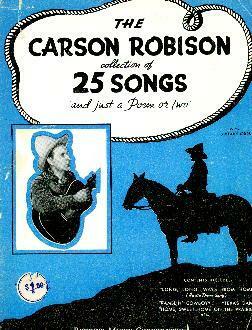 * Carson J. Robison's world's greatest collection of mountain ballads and old time songs. Chicago: M. M. Cole Publishing, 1930. 67 p. 50 songs. Cover: "M.M. Cole edition of ...". See: "Dying cowboy," "Bury me out on the prairie." * Carson J. Robison's world's greatest collection of mountain ballads and old time songs. Chicago: M. M. Cole Publishing, 1930. 67 p. 50 songs. Variant. * The Carson Robison collection of 25 songs "and just a poem or two." New York: Robbins Music Corp., 1936. 56 p. Ill. 25 songs. The Carson Robison collection of 23 songs "and just a poem or two." New York: Robbins Music, 1934. 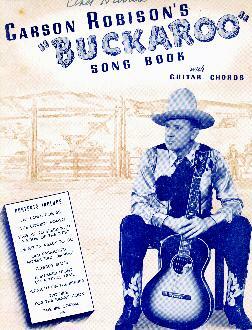 * Carson Robison's "Buckaroo" song book: with guitar chords. New York: Robbins Music Corp., . 64 p. 25 songs. 50 cents cover. * Carson Robison's "Buckaroo" Song Book: with Guitar Chords. New York: Robbins Music Corp., . 64 p. 25 songs. 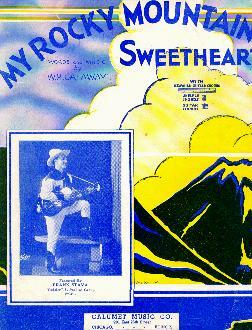 60 cents front cover; back cover with different song folios. * Carson Robison's "CR" Ranch song folio. New York: Southern Music Publishing (Peer International), 1941. 64 p. 30 songs. * Carter, A.P. I'm thinking of my blue eyes / A.P. Carter. New York: Southern Peer International, 1941, c1929. 2 p. "Featured by Wilf Carter". * Carter, A.P. I'm thinking of my blue eyes / A.P. Carter. Toronto: Canadian Music Sales, 1941, c1929. [2pp]. "Featured by Wilf Carter". 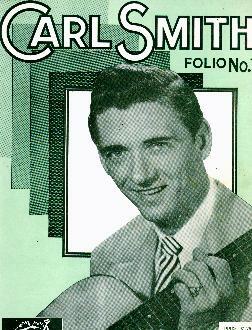 Carter Family album of Smokey Mountain ballads. Np nd 25 songs. Cecil Campbell's roundup of folk songs. New York: Hill and Range Songs Inc., 1953. Chuck Wagon Gang's #2 roundup of song hits. New York: Dixie Music Publishing, 1944. * Cindy Walker's folio of songs. No.1. Portland, OR: American Music Inc., 1942. 50 p. 20 songs. * Cliff Carlisle greatest collection of cowboy and mountain songs. Chicago: M. M. Cole Publishing, 1936. 64 p. 50 songs. Cliff Carlisle new revised book. Chicago: M. M. Cole Publishing, c1941. 64 p. ?50 songs. 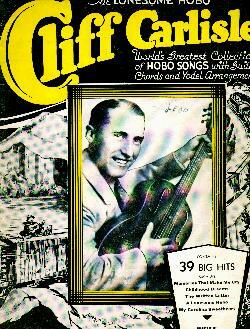 * Cliff Carlisle world's greatest collection of hobo songs with chords and yodel arrangement. "The Lonesome Hobo." Chicago: M. M. Cole Publishing, 1932. 64 p. 39 songs. See: "When its Roundup Time in Texas,"
* Cliff McKay's Holiday Ranch song book. Toronto: Gordon V. Thompson, 1956. 49 pp. 22 songs. * Clyde and Slim (the Roving Hillbillies) farm and fireside songs. Chicago: Country Music, 1944. 48 p. See: "Calamity Jane," "Hit the cowboy trail," "I've traded my pony for a mustang," "My western pal," "South Texas stampede." Ill. 37 songs. * Clyde and Slim (the Roving Hillbillies) farm and fireside songs. Book no. 2. Chicago: Country Music, 1945. 48 p. Ill. 37 songs. * Cobb, George L. Alabama jubilee / George L. Cobb. New York: Remick Music; Toronto: Canadian Music Sale, 1965. 2 p. Cover: King Ganam "King of the fiddle" and his Sons of the West. * Cobb, Hazel. 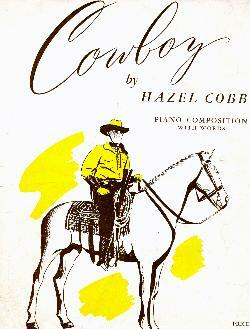 Cowboy / Hazel Cobb. New York: Mills Music, 1945. 3 p.
* Come a singing! Canadian folk-songs. Compiled by Marius B. Barbeau, Arthur Lismer, Arthur Bourinot. National Museum of Canada. Bulletin no.107, anthropological series, no.26. 1947. 59 p. See: "Remember the Red River". * Cooke, Chas. S.; Whiting, Richard A. I've got the "Blue Ridge blues" / Chas. S. Cooke and Richard A. Whiting. Lyrics by Chas. A. Mason. New York; Detroit: Jerome H. Remick, 1918. 3 p.
* Cooper, George; Tucker, Henry. Sweet Genevieve (My Genevieve) / George Cooper and Henry Tucker. New York: Stasny Music, 1948. 5 p. Modern version by Harold Potter and Rodd Eddy. An Argosy Pictures Production "Fort Apache." Featured by Morton Downey. 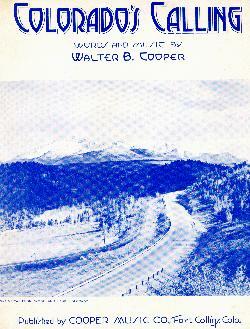 * Cooper, Walter B. Colorado's calling / Walter B. Cooper. Fort Collins, CO: Cooper Music, 1947. 5 p.
Copeland, Carl Williams. I'd like to be in Texas / Carl Williams Copeland. np, 1935. * Coulter, Jimmy. Songs of a cowboy, containing 7 grand hillbilly songs. London, England: Peter Maurice Music Co., 1937. 18 p.
Country and western express. 1954-? * Country music hits Charlton Publications: Derby, Conn.
v.1, no. ?, Spring 1969. 64 p.
* Country song roundup: hillbilly, folk, western picture magazine. Charlton Publications: Derby, Conn. c1950? Bimonthly. v.1, no.7, Aug. 1950. 34 p. 72 songs. v.1, no.15, Dec. 1951. 34 p. Cover: Lefty Frizzell. v.1, no.18, Jun. 1952. 34 p. Cover: Hank Williams. v.1, no.21, Dec. 1952. 34 p.
v.1, no.22, Feb. 1953. 34 p.
v.1, no.23, Apr. 1953. 34 p.
v.1, no.24, Jun. 1953. 34 p. Cover: Hank Williams. v.1, no.25, Aug. 1953. 34 p.
v.1, no.26. Oct. 1953. 34 p.
v.1, no.27. Dec. 1953. 34 p.
v.1, no.28. Jan. 1954. 34 p.
v.1, no.30. Mar.-Apr. 1954. 34 p.
v.1, no.31. May 1954. 34 p.
v.1, no.32. Jan. 1954. 34 p.
v.1, no.34. Sep. 1954. 34 p.
v.1, no.35. Nov. 1954. 34 p. Cover: Hank Snow. v.1, no.37, Mar. 1955. 34 p.
v.1, no.38. May 1955. 34 p.
v.1, no.40, Sep. 1955. 34 p.
v.1, no.41, Nov. 1955. 34 p.
v.3, no.47. Dec. 1956. 34 p.
v.4, no.48. Feb. 1957. 34 p.
v.6, no.50. Jun. 1957. 34 p.
v.8, no.52. Oct. 1957. 34 p.
v.11, no.58. Jan. 1959. 34 p.
v.11, no.60. May 1959. 34 p.
v.12, no.64. Jan. 1960. 34 p.
v.12, no.67. Jul. 1960. 34 p.
v.12, no.68. Sep. 1960. 34 p.
v.12, no.69. Nov. 1960. 34 p.
v.13, no.74. Nov. 1961. 34 p.
v.14, no.78. Nov. 1962. 34 p.
v.21, no.124. Nov. 1969. 48 p.
* Country songs and stars. Derby, Conn.: Charlton Publications, c1950? bimonthly. v.16, no.80, Dec. 1965. 32 p.
v.17, no.84, Sep. 1966. 32 p.
v.18, no.90, Sep. 1967. 16 p.